Composting improves soil’s ability to retain water, which may help you save money on the water bill! Composting can be a carefully curated cast of characters. True, it’s easy enough to pile your leftover fruit and veggie kitchen scraps in with lawn clippings and leaves to create a basic compost. That will yield results—eventually. 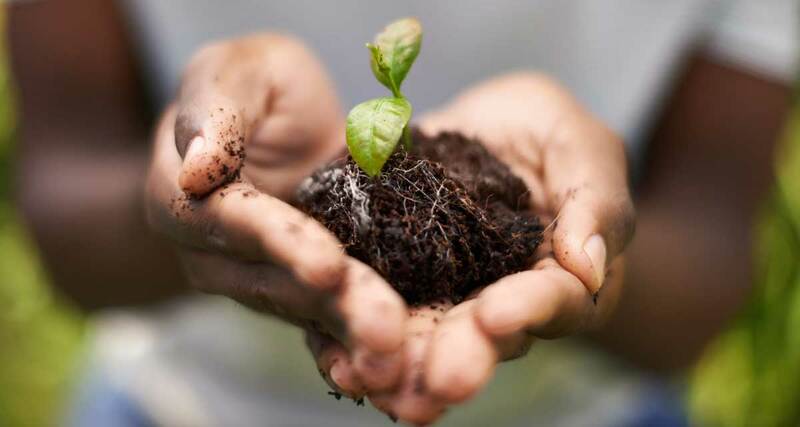 But if you’re interested in attaining some DIY soil a little more quickly, or curious to know more, here are some of the key characters you’ll want to become familiar with in order to direct the best production. These little powerhouses are the star of the show. They need oxygen (aerobic) to help break down all the matter you put in your compost bin. To create nutrient-rich matter in a timely manner, you need the right environment to encourage a healthy population of these good guys. These guys steal the scene when the pile has gotten compacted and has little to no air flow. Because they thrive in an airless environment (anaerobic), they have the power to overwhelm the population of the aerobic bacteria. A burgeoning population of anaerobic bacteria can bring composting to a near standstill. Carbon-rich matter, or browns as they’re also known, are like the carbs in the diet of those good-guy bacteria. Think of browns like the colors they often are: dried grass cuttings, dried leaves, sawdust and shredded newspaper. Those hero bacteria also need to consume protein—enter the nitrogen-rich matter, or greens. These are your kitchen scraps from fruits and veggies, as well as things like coffee grounds (and your coffee filters, though technically, they are a brown) and green grass clippings. Water stars as herself in this mellow-drama. You’ll need the right amount of moisture to ensure your good-guy bacteria neither drown nor dehydrate. This character enters to stir things up when the plot … uh, compost thickens. Properly tended, compost does not smell! Rather, it does not smell bad—it should smell rich and earthy. Here are some troubleshooting tips if your compost develops an unsavory scent. An ammonia odor means you have too much nitrogen-rich, green matter. Adding some browns to the pile, like shredded newspaper, dried leaves or straw, and giving it a swirl with the pitchfork should help immensely. Also, compost that has been layered, but not turned recently can emit this eye-watering aroma. Smells like sulfurous rotting eggs? If the pile is too damp or has become too compacted the result is a distinctive undesirable odor. If it’s been layered too tightly, simply turning the pile may alleviate the odorific problem. If it’s too wet, adding some carbonaceous materials and turning the pile will help give our compost heroes, the aerobic bacteria, a chance to breathe and thrive. Our bacterial heroes require a proper ratio of green/nitrogen-rich to brown/carbonaceous matter or N:C. This proportion can be anywhere from 50:50 to 20:80 depending on environmental conditions and how quickly you want your pile to become useable. Additionally, they are living organisms and require a balance of air and water which you’ll achieve by turning the pile (aeration) and occasionally watering it if it becomes too dry. Ultimately, your compost pile should look like dirt when it’s done, with an earthy smell (not like decayed, rotted food) and you shouldn’t be able to recognize any of the matter you added to it earlier. The rapid composting method, also known as the Berkeley Method, can effectively create compost in as little as 14 days!